Cable Markers are made from high quality plasticised PVC. It's unique design gusset allows easy and quick fitting of marking on wires and cables. The products help people effective and clearly manage the bulk of cables. The cable marker features high quality flexible interior to fit various cable diameters, and retracts to hold wires firmly in position. 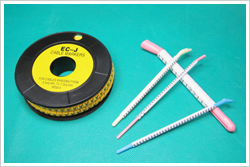 The Slip-on Wire Marker have high flexing ability to grip the wire marker tightly without sliding.